They're a 3-piece rock band of young guys who know how to make good music while being real and having fun at the same time. With a must-see live show and an excellent new third-release Learning to Breathe, Switchfoot is a band that has much to say with fans who are ready to listen. I got the pleasure of asking lead singer Jon Foreman a series of questions regarding the band and their new release. This interview took place on: 9/25/00. 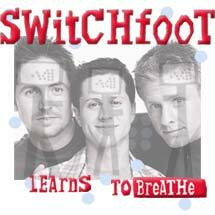 Jesus freak Hideout: What's the story behind the name "Switchfoot"? Jon Foreman: Switchfoot is a surfing term. We all love to surf and have been surfing all our lives so to us, the name made sense. To switch your feet means to take a new stance facing the opposite direction. It's about change and movement, a different way of approaching life and music. Jesus freak Hideout: How did you get started in music? Jon: My brother and I have been playing music together as long as I can remember. I've known Chad since high school. Chad and I were at the same college when the bands that we were in went their seperate ways. That's when we decided to try to do something together. Jon: Guitar driven pop that might make you whistle, tap your foot, or think. JFH: What kind of changes, if any, were you looking to make for your new album, Learning to Breathe? Jon: We have never really tried to emulate "a sound." We try to tackle each song separately. The production was more of a planned change however. Musically, we wanted to start from a three-piece foundation and build from there, maybe throwing the kitchen sink on top instead of using the kitchen sink as a starting place. JFH: What is the song "I Dare You to Move" about? Jon: The song is fairly straight-forward. We have been given a new day. Our eyes open and our choices begin. Will we live half asleep? Or will we change our world; will we be Christ's hands and feet, the salt and the light of the world? I sing this song to myself and all others on a planet where complacency reigns supreme. JFH: Can you tell us a little about the title track off your brand new album Learning to Breathe? Jon: I've been through a lot of growth this year, learning of my deep needs and of my human depravity. But deeper than all of this is Christ's love for me. "He does not treat us as our sins deserve or repay us according to our iniquities. For as high as the heavens are above the earth so great is His love for us." This is the spiritual world that we have been called to and the kindom of the heavens is here. We are learning to breathe in the atmosphere of grace. JFH: What is the story behind, and what inspired "Poporazzi?" Jon: The pop world is a funny thing. We can satirize it and poke fun and say that superstars have no relevance in normal lives. But no one is immune and we are all very effected by the media, the T.V., and, of couse, the Backstreet Boys. Jon: I must start by saying that what I do is an incredible gift, and I am very thankful to be playing music for people who want to listen. But every job has it's difficulties. One hard thing is that we seldom get to attend our home churches because we are normally out of town on the weekends. The travelling can be very detrimental to relationships. But probably the strangest thing is the contradiction of being on stage and trying to be the least. The tendency in todays culture is to want to be a "star," but I want to be a servant. Jon: Finishing my college degree, traveling, or teaching kids. JFH: What is your favorite Switchfoot song? Jon: This always happens to be the one that I just wrote the day before! Jon: Dumb and Dumber is pretty funny. Jon: Singing with charlie peacock, sarah masen, tim and chad in Amsterdam. JFH: What does the future hold in store for Switchfoot? Jon: We have tried not to make many assumptions about the future. I'm pretty sure I'm going to be playing songs with Tim and Chad for a while, though. Jon: Sometimes it can be really hard in our fast paced society to slow ourselves down enough to begin to listen to God's voice. The dilemma exists in my position as well. To be a follower of Christ is to emulate Him. When He went off alone into the desert to pray, He was teaching a valuable lesson.